Fire danger is a measure of the relative seriousness of burning conditions and threat of fire. The National Fire Danger Rating System (PDF, 250KB) is applied to reflect the general conditions of either current or future fire situations. Conditions of wildland fuels are observed and used to calculate and predict fire potential. Fire danger is usually expressed as low, moderate, high, very high and extreme. 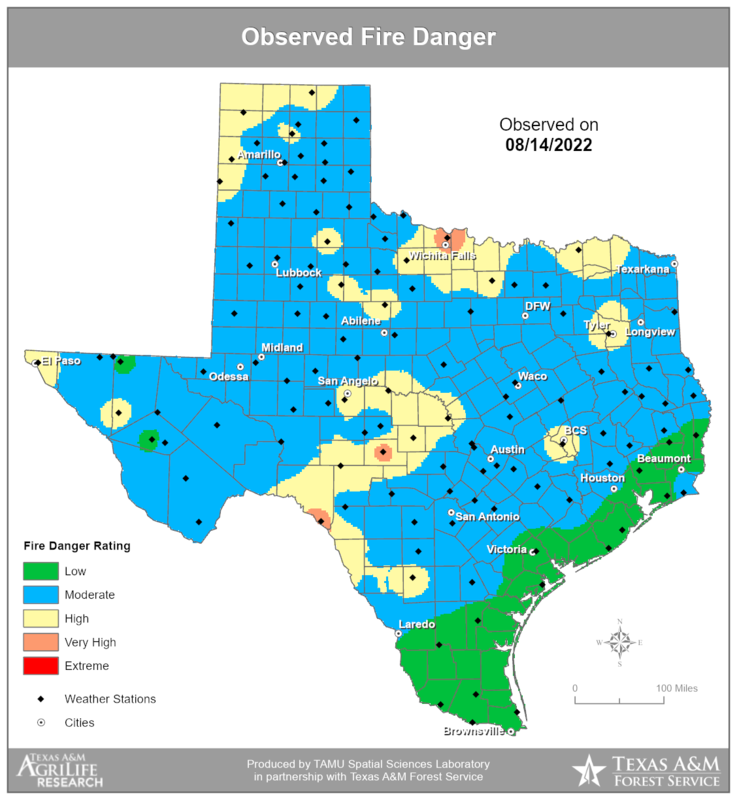 Fire danger ratings are generated from data collected daily at remote automated weather stations located across the state. The collected data is then entered into the national fire danger rating system processor. The NFDRS processor will then generate a number of outputs including the fire danger rating. Using this information, daily and seasonal forecasts of fire danger are made to assist state and local governments in preparing for and responding to periods of elevated fire danger or fire seasons. Through our Predictive Services department, Texas A&M Forest Service staff work on assessing and monitoring Texas wildfires. For more detailed fire danger products, please visit the TICC - Predictive Service.